The barista in the coffee shop doesn't flinch when Philip Campbell, founder of Kerv, pays for our drinks using a ring on his right ring-finger. Mind you, we are in London's swanky East End and this Shoreditch attendant is no doubt more than familiar with contactless payment devices than most. Kerv is looking to take on the likes of Apple Pay, Google Wallet and Barclays in what's fast becoming a crowded space. Campbell's plan though, is to make the process as hassle free as possible. "This is a completely different solution," he told us. "Sometimes simplicity is the best thing. I want to make a really killer product." Campbell was working for a digital marketing agency, dealing with clients who wanted virtual payment solutions, when the idea of a smart NFC payment ring hit him. "Increasingly we got frustrated," he explained. "A lot of the time there's no consideration about the user and what he actually wants. In the payments sector, we're just lagging behind. I was getting frustrated by our clients and I thought that we could do so much better." So that's what he did. 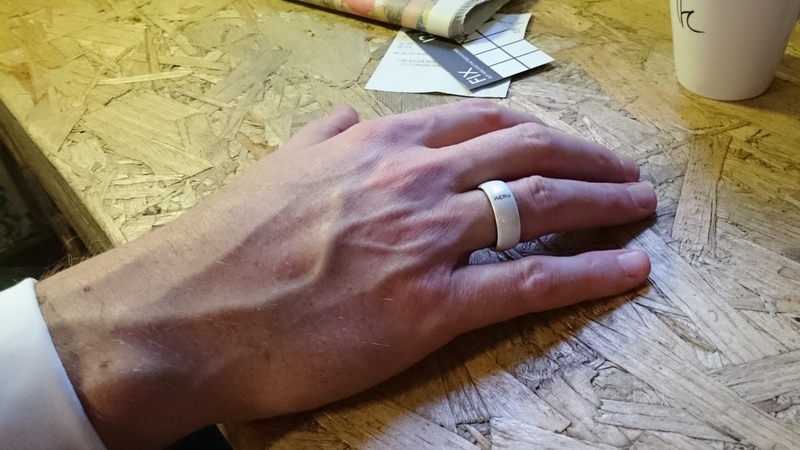 Just launched on Kickstarter, the Kerv ring is as simple an NFC product as you're likely to come across. The chip and antenna are built into the inside of the ring, covered in a sealed resin and surrounded by a ceramic outer layer. There's no display, it won't buzz when you get smartphone notifications, it doesn't track your biometrics and it cares not for gesture controlling your smart home. It simply lets you tap into the NFC contactless world – whether that is for instant payments, public transport validation or smart lock entry. What's more it doesn't require charging. On the payments side it can already be accepted wherever Mastercard and Visa contactless cards can – over 38 million places at the last count – and you simply top up your funds through your online portal. Users get an account number and sort code and can request a contactless Mastercard to link to their Kerv account if they wish. You can even link your bank, PayPal-style, so the balance automatically tops up when you're running low. But why would you choose to wear a ring when your smartphone or smartwatch would do the job? According to Campbell it's down to the price. "Apple Pay and the Apple Watch have done a huge job in promoting contactless payments but you have to spend a lot of money before you even get access to that," he explained. Kerv is set to retail for around £50 in the UK, with £20 of credit already on-board. Usability and style are other reasons the Kerv founder thinks his ring is a winner. "The user experience isn't quite there yet," he told us. "Barclaycard have done a great job with contactless – even though their product looks like you've been tagged and you're on day release." He's talking, of course, about bPay. "In terms of the big banks, they are definitely innovating and you've got to applaud them for that. But, as a big company though, they are just not as innovative as they can be. "We were really worried when we heard they were bringing out a second version. We expected it to be better. But it wasn't." Kerv will launch in 10 different ring sizes and Campbell was keen to stress that there will be a pre ring measuring service on offer for people not sure of their digit size. The company is also looking at solutions to the problem of digital payment accounts having a three-year expiry date. The Kickstarter campaign, which is well on its way to achieving its £77,000 target, isn't a life or death situation for the London-based start-up. It's more about creating awareness and growing an early user base. "It's not about raising the amount of money we need to launch – that's not what we're doing it for," said Campbell. "It's about demonstrating the product to an audience. "It's been genuinely great to see people's reactions and there have been a lot of good suggestions. Kerv certainly hits its objectives of staying simple but it could already face serious competition. Back in 2013, the NFC Ring smashed its crowdfunding goal on Kickstarter and now it's back with a new design, better range, and more storage. The NFC Ring 2 boasts a redesigned antenna with up to three times the range of its predecessor so it can be used with devices with weak NFC signals, or smartphones with thick cases. It's currently available for £23 on Kickstarter. We've backed both campaigns so we'll be keeping a close eye on how this emerging genre develops.